Footnote: This teapot and cover is one of four Limehouse examples included in a lot sold by Christie's on 14 October 1948 from the contents of Wentworth Woodhouse in Yorkshire, the seat of the Earls Fitzwilliam. They were described as '..probably Lowestoft...' and the lot, which also included a pair of sauceboats and a mug, sold for 22 guineas. The buyer was David Manheim, who sold the teapots on to Geoffrey Godden's father, mindful of his son's interest in Lowestoft. Geoffrey was then able to buy three of the teapots from his father for £11. The fourth was sold and is now in the George R Gardiner Museum of Ceramic Art, Toronto. 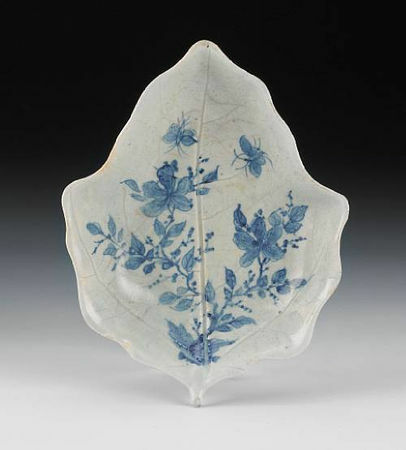 All four are illustrated by Geoffrey Godden, English Blue and White Porcelain (2004). The present lot is colour pl. 16 and pl 87. The cover is shown in detail at pl 88, p 85 where it is mentioned that the cover may not match the body decoration. The Toronto example painted with the same design is shown at pl. 89 and another with Buddhistic emblems at colour pl 17 and pl 90. 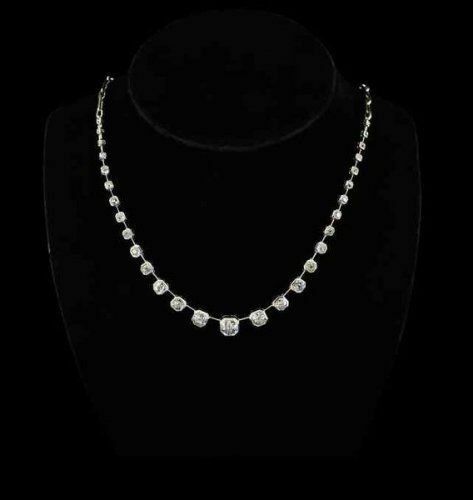 A fourth example is the following lot in this sale and is shown at colour pls. 18 and 19. 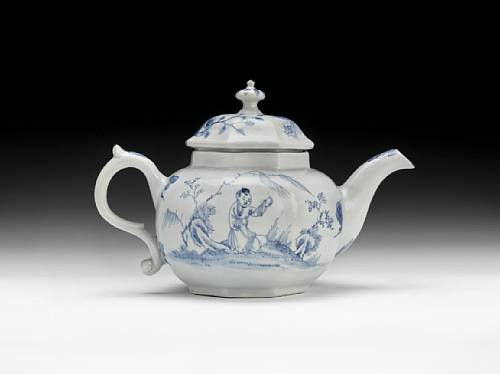 These Wentworth Woodhouse teapots are discussed at length on pp. 84-93. 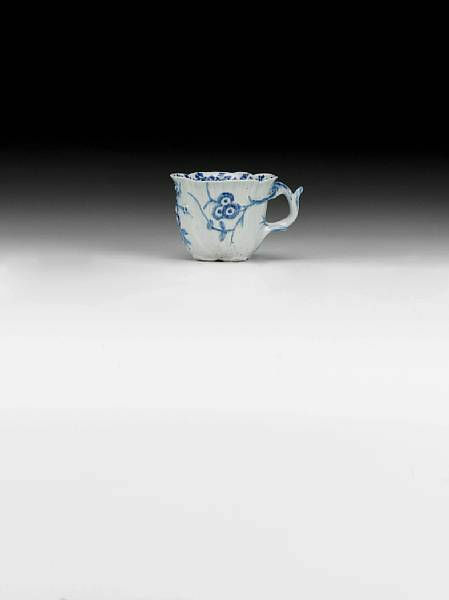 See also Geoffrey Godden, Eighteenth-Century English Porcelain, A Selection from the Godden Reference Collection (1985), Chapter 4 and Limehouse Ware Revealed (1993), pl 45, p 32 and pls 47 and 48 for related fragments. This lot is illustrated alongside further related shards by David Barker and Sam Cole (ed), Digging for Early Porcelain, fig 16, p 50, and it is also illustrated by Geoffrey Godden, An Introduction to English Blue and White Porcelains (1974), pl. 19, fig. 94 and British Porcelain, an Illustrated Guide (1974), pl. 319. 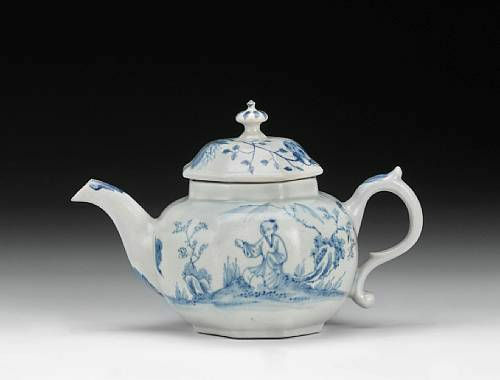 For other Limehouse teapots sold in these rooms see the Watney Collection, Part 1, lot 129 and Part 3, lot 909, also the Sutherland Collection, lot 104. 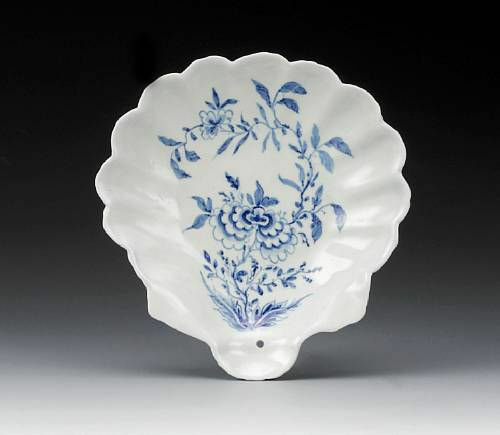 Footnote: Illustrated by Geoffrey Godden, English Blue and White Porcelain, pl 95, p 92, pl 77, p 72 and colour plate 10, p 701, British Porcelain, An Illustrated Guide (1974), pl 319, p 269, An Introduction to English Blue and White Porcelains (1974), pl. 19, fig. 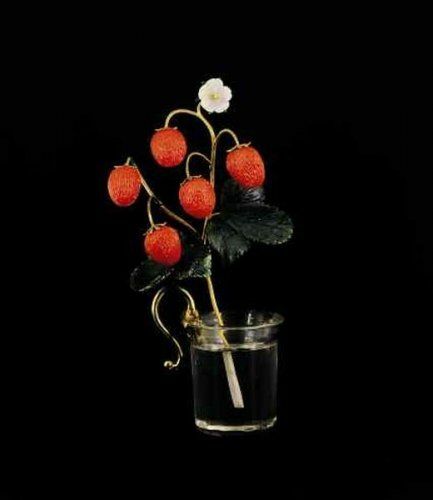 97 and British Porcelain, an Illustrated Guide (1974), pl. 319. It is also illustrated in Eighteenth-Century English Porcelain, A Selection from the Godden Reference Collection (1985), pl 38, p 44. 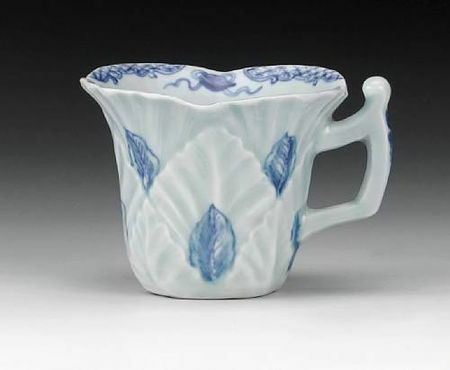 No other example of this form of cup appears to have been recorded. The moulded decoration of overlapping leaves is seen on some Limehouse sauceboats and creamboats. See the sauceboat, lot 42 in this sale, illustrated in Limehouse Ware Revealed (1993), pl 65, p 36 and the creamboat illustrated at pls 96 and 97. Overlapping leaves in a slightly different form are also seen on Limehouse scent bottles and vases illustrated at pls 87 and 88, p 42. The distinctive handle is similar to that found on a Limehouse creamboat from the Billie Pain Collection, lot 90 and provides a link to Lund's Bristol, founded by 'one of the principal manufacturers at Limehouse which failed'. 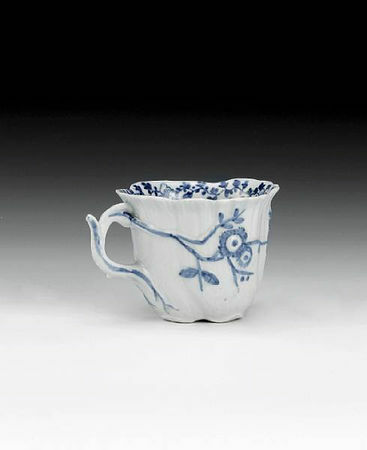 Footnote: Illustrated by Geoffrey Godden, English Blue and White Porcelain (2004), colour pl. 23 and pl. 106. 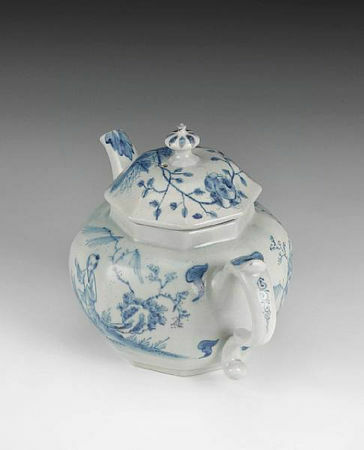 Also illustrated in An Introduction to English Blue and White Porcelains (1974), pl. 19, fig. 95 and British Porcelain, an Illustrated Guide (1974), pl. 319. Two other bottles of related type were in the Watney Collection, Part 1, lot 117 and Part 3, lot 907. 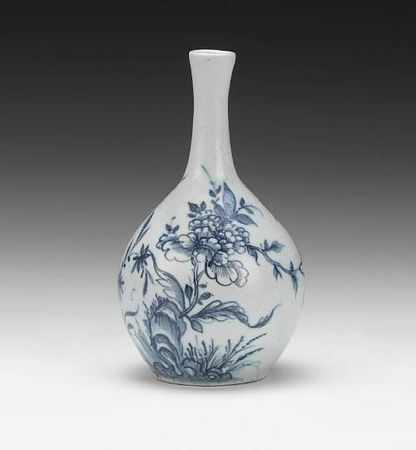 One of these is illustrated together with a waster of a similar bottle found on the Limehouse site, in Limehouse Ware Revealed (1993), figs. 56 and 58 and The Limehouse Porcelain Manufactory (2000), figs 60 and 61.